Then again, you can always select a bouquet of mixed colors, which is just as beautiful. 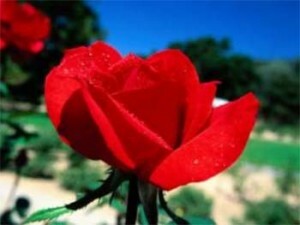 Red rose is the traditional symbol of love and romance. Pink rose is a symbol of grace and elegance, admiration and appreciation. Yellow rose is a symbol of warmth and happiness, joy and friendship. White rose is a symbol of innocence, purity, honor, reverence, marriage and new beginning. Orange rose is a symbol of passion, desire, enthusiasm, fervent romance, excitement. Lavender rose is a symbol of enchantment, and feelings of love at first sight. I hope you don’t worry too much about the color, since women love roses, period! If you know that the special person in your life loves certain colors, then it does not matter what symbolic meaning has been assigned to these colors, just go ahead and go for her favorite color. Happy Valentine’s Day! I love the photo of the painted looking rose you have up top. Thanks for sharing all the meanings…I knew Yellow was friendship but I didnt know about the other colors. The purple rose is beautiful. Im actually not a big fan of roses…not my favorite flower. I love lilies, calla lilies, hydrangeas, daises, gerber daises, and tulips! We’re using hydrangeas and calla lilies for our wedding!! Have a great weekend! Happy Valentine’s Day to you and your soon to be hubby!!! I love all flowers, but I prefer growing them rather than watching them die in a vase. Roses are very expensive around Valentine as well, so I feel for those young fellows trying to impress a girl.. It was a beautiful day…no additional snow…so we had time to enjoy the day. Hopefully you enjoyed your day as well. Sounds like you had a great V-day with no snow. I too love to grow roses rather then buy them. Prices are not too bad here – 1 doz 19.99. And congrats on your will power for the diet. I think I love sweets to much to try it…..especially with Fat Tuesday! You bake so often, so it would be quite difficult to deprive yourself of sweets. Actually, I am in the phase where I could have a couple of small cookies, but I try not to until I reach me goal. I’m telling you I had a hard time looking at your delicious looking pachki and not salivating. Wow…I have seen some roses at $75doz…..ouch. This is a wonderful blog and the gardening community is better off for it! I just checked out your site and there is lots of very useful gardening information. I am sure I will visit it regularly. My love is my wife. she loves roses, but for me she just like a diamond. so worth for me. I love her forever. In every occasion I will give her different roses. Great idea! I like it. You sound like a very loving and caring husband. It is a great idea to give your wife different color roses for different reasons.